What do you have in common with Ariana Grande, Selena Gomez and Kevin Hart? Besides your captivating stage presence — of course — you were all born between June 21 and July 22 — under the sign of The Crab. As a Cancer, you’ve got some serious Penny Hoarder potential. Cancers are tenacious and nurturing, emotionally honest, and best of all, innately thrifty, according to Astrology.com. However, you also have a few Cancer traits that challenge your financial savviness. But that’s OK — we’ve got tips to help you embrace all the qualities of your sign, while keeping your money under control. The Crab in you loves to nurture others. You’re probably great in jobs where you get to care for children, animals, the elderly or people with disabilities. The world is happy to have people like you! If you don’t have a caretaking job, or you want to earn extra money on the side, try taking care of people right in your home. Earn money as an Airbnb host. If you live in a desirable location, you could bank hundreds (or even thousands) of dollars a month renting a spare room with Airbnb. Your natural nurturing spirit will ensure you create a welcoming, comfortable space to help guests enjoy their stay in your city. Make your space available during high-demand times. Think: concerts, conventions and sporting events in your area. Make sure your place is stocked with the toiletries you’d expect at a hotel — toilet paper, soap and towels. Be personable. Help travelers get the most out of your city by being a helpful and friendly host. You’re happiest when you can find tranquility at home. Ensure a calm, serene space by preventing clutter. Take a day or two this month to clear your head by clearing out the unnecessary junk you’ve got lying around your house. Oh, and make money while you’re at it! The Decluttr app buys your old CDs, DVDs, Blu-rays and video games, plus tech hardware like cell phones, tablets, game consoles and iPods. Just download the app and start scanning the barcodes on your media to get immediate quotes. It’s free to use, there are no listing or seller fees, payment comes in a couple of days and even shipping is free. For just about everything else, use Letgo. This intuitive app lets you snap a photo and list your item for sale in less than 30 seconds. Plus, it’s free to use. Download Letgo — and get rid of your clutter — right here. Your penchant for family and community means you love working alongside other people. That can make building a flexible career tough — unless you know where to look. When you’re feeling chummy, avoid solitary work like freelancing. Instead, venture into the world by driving with Uber or Lyft. These ride-hailing services let you make your own schedule and work for yourself, while meeting new and interesting people. Paul Pruce, a Lyft driver in Philadelphia, said the unexpected stories are one of his favorite parts of the job. As an Uber contractor, your earnings will be calculated by adding a base fare, plus time and distance traveled after your pickup, minus a service fee. To drive with Uber, you must be at least 21 years old, have three years’ driving experience, an in-state driver’s license, a clean driving record and be able to pass a criminal background check. Your car must be a four-door, seat at least four passengers, be registered in-state and be covered by in-state insurance. Because it’s simple to switch between apps, many drivers also sign up to drive with Lyft at the same time. The company recently announced it’s expanding into 100 new cities this year. If it’s not available in your city, keep an eye out! It’s expanding in the Southwest, the Southeast, the Carolinas, the Rockies, the Midwest, New England and Central California. To drive with Lyft, you’ll need to be at least 21 years old with a year of driving experience, pass a background check and own a car made in 2007 or later. 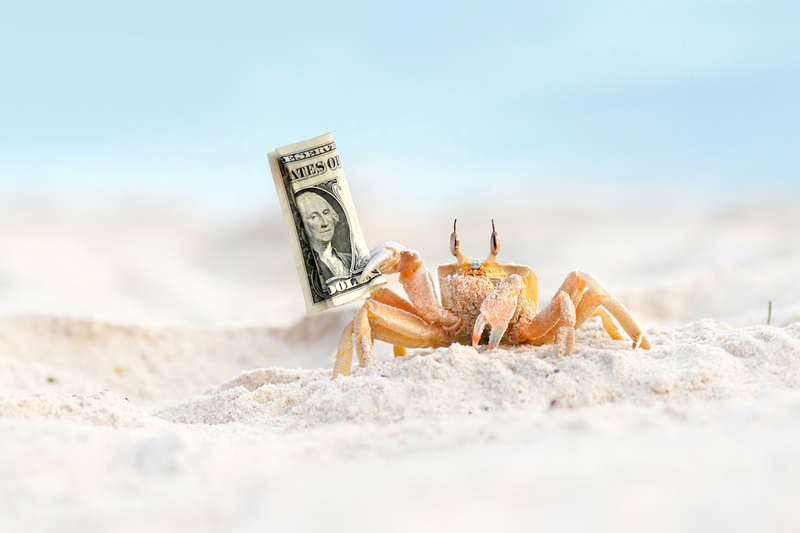 We’re not sure where the term “crabby” came from, but it sure fits The Crab. You wear your heart on your sleeve, so no one has to wonder when you’re happy, sad or upset. Some people in your life probably appreciate the honesty — and some would rather just give you space. If you like to scour stores for the best deals, we bet you’re quick to let a customer service rep know when something doesn’t add up. Complaints seem to be a great way to get a discount, after all. You can avoid ruining someone’s day and get your discount by using Paribus, instead. This online tool searches your email for receipts, then watches for price changes after you’ve shopped. Then it negotiates cash back on your behalf. No more stressful calls with customer service. The flip side to your love of community is the tendency to retreat away from everyone when you’re feeling blue. Like the real crab, you hide in the comfort of your shell when your mood makes human interaction unpalatable. On those days, be prepared to make money through work that lets you avoid talking to other people. Learn to be a bookkeeper, and earn up to $60 an hour helping entrepreneurs run their businesses. Bookkeeper Business Launch is a 10-week course to teach you how to start a bookkeeping business. Become a proofreader, and help authors, journalists and academics perfect their copy. Proofread Anywhere teaches you the proofreading and business skills you need to get started. You’re probably the kind of person with a huge change jar somewhere in your house, diligently clearing your purse or pockets of loose change every time you come through the door. We found an app that lets you apply this frugal habit to your digital purchases, too. Acorns connects to a debit or credit card, rounds up your purchases to the nearest dollar and funnels your digital change into an investment account. You’ll create a financial profile in the app to let Acorns know how you want to invest. It will set up a portfolio based on your needs, so you don’t have to actively manage your investment. It’s also an actually affordable way to invest. For a balance below $5,000, you’ll pay a monthly fee of $1 plus 0.5%. There’s no minimum investment required — just let the app round up your digital change, and grow your money without thinking about it. You can download Acorns here. Your love for community means you’ll enjoy team sports… but staying active on your own is a different story. If you want to get in shape and lose weight, we found the perfect way to stay motivated. You’re about to receive a big check you can spend to celebrate or wisely stick into savings — all just for losing weight! It’s not a fantasy. If you wager on your weight-loss commitment with HealthyWage, this could happen for you… as long as you stick to your guns and hit your goals. Define a goal weight and a timeframe to achieve it. Place a monetary bet on yourself, between $20 to $500 a month. HealthyWage’s calculator will consider how much weight you have to lose, how much time you give yourself and how much money you wager to determine your reward. You could win up to $10,000. Meet your goal, and you’ll get your reward. Fail to lose the weight on time, and you forfeit the money you bet. Here’s a fun way to make money using a Cancer’s innate strong will: Join a mock jury. Serve as an in-person or online mock juror to help lawyers prepare for real cases. You can earn $10 to $60 for about an hour of your time. In person, you’ll probably sit through a mini version of a court case, listening to opening and closing arguments from each side. Online, you’ll simply review evidence from one side, including documents, videos and photos. Like a real juror, once you’ve heard the case, you get to weigh in. In person, you’ll even deliberate with other jurors — putting your natural tenacity to good use! Harnessing your Cancer traits to earn money is a sweet bonus. But we know deep down you’re most interested in being surrounded by people you love. To help build a financial, professional and family life that satisfies The Crab, read these inspiring stories from four supermoms who work from home while raising kids.